The reason I joined the Daring challenges was so that I could learn more about different types of everything. I like to research what we are meant to be making, and find an unusual or different recipe to the one we are presented with in the challenge. This is so that the world is not inundated with the same recipe from hundreds of people, all in one day. While researching griwech I discovered that these sweet treats form part of a group of pastries including baklava. Griwech are deep fried, and it is the shape that gives them their name. One site I found informed the reader to shape the griwech by watching someone do it in front of you! Well, I don’t have any Algerian friends living close to me and in South Africa, our deep fried pastry treats are koeksisters. But, I gather you can make any shape and as long as the pastry is fried, and then soaked in honey, they can be called griwech. I might be wrong about this, so please if someone knows better, feel free to correct me. I chose to use a cookie cutter to make my griwech shapes as this was the easiest option for me. These sweet treats were enjoyed by everyone who tried them. To grind your sesame seeds, place them into a clean spice grinder. If you don't have a thermometer to measure the temperature of the oil drop a small ball of the dough into the oil. If bubbles form around it, the oil is hot enough. These look so fancy and tasty! I have never heard of griwech, now I need to investigate further. Thank you for sharing! I believe there’s a special cutter for the traditional griwech, at least that’s what my Algerian friend told me. Having said that, I have seen them in different shapes for those who don’t have the cutter and wanted to make life simple. 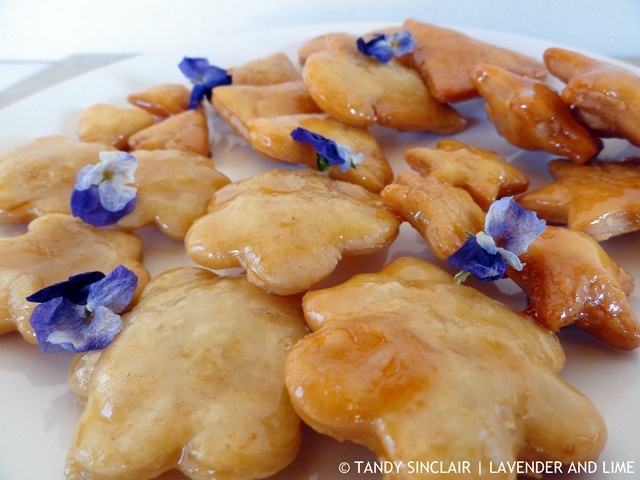 Pastry flavored with orange water and saffron and fried and soaked in honey sounds pretty heavenly, Tandy! The great thing about TDB is discovering other blogs who participate, great blog. And love how cute your griwech turned out. These pastries look super yummy Tandy. Eek! Saffron! The price of which makes me want to cry :(. I never say “no” to deep fried pastry. This looks delicious. Looks delicious Tandy, my Italian mother-in law makes something similar to this and we all look forward to it around the holidays! Do you know what they are called Cheri? Yum! These look so fancy and delectable, while still being so easy to make! These look absolutely delicious! Great share, Tandy! I love the idea of using the cookie cutter. It makes the recipe a little bit easier and has a great presentation. Very nice job Tandy. These sound absolutely delicious! Love that they’re soaked in honey – always a good thing. Love the look and sound of these Tandy!